1.Guangcheng Guo, Fang Wang, et al. "Long non-coding RNA PVT1 facilitates cell proliferation by epigenetically regulating FOXF1 in breast cancer." RSC Adv., 2018, 8, 2740. Description EPZ005687 is a potent and selective inhibitor of EZH2 with Ki of 24 nM, 50-fold selectivity against EZH1 and 500-fold selectivity against 15 other protein methyltransferases. Compound was incubated for 30 mins with 40 μL per well of 5 nM PRC2 (final assay concentration in 50 μL was 4 nM) in 1× assay buffer (20 mM Bicine [pH 7.6], 0.002% Tween-20, 0.005% Bovine Skin Gelatin and 0.5 mM DTT). 10 μL per well of substrate mix comprising assay buffer 3H-SAM, unlabeled SAM, and peptide representing histone H3 residues 21-44 containing C-terminal biotin (appended to a C-terminal amide-capped lysine) were added to initiate the reaction (both substrates were present in the final reaction mixture at their respective Km values, an assay format referred to as “balanced conditions”). The final concentrations of substrates and methylation state of the substrate peptide were indicated for each enzyme. Reactions were incubated for 90 mins at room temperature and quenched with 10 μL per well of 600 μM unlabeled SAM. The mixtures were then transferred to a 384-well flashplate and washed after 30 mins. The solubility of this compound in DMSO is limited. General tips for obtaining a higher concentration: Please warm the tube at 37 °C for 10 minutes and/or shake it in the ultrasonic bath for a while. Stock solution can be stored below -20 °C for several months. EPZ005687 significantly inhibited the proliferation of WSU-DLCL2 and Pfeiffer cells, with minimal effects on the proliferation of OCI-LY19 cells. 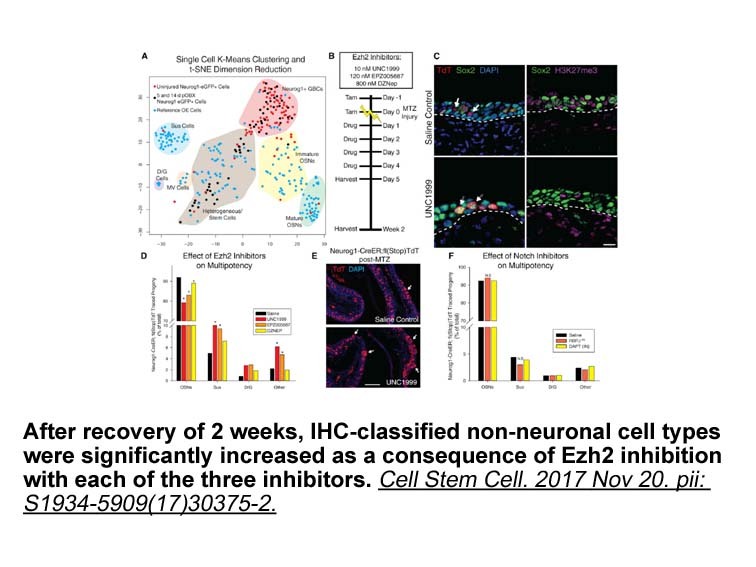 Intra-articular injection of EPZ005687 delayed OA development in mice.
. Knutson SK, Wigle TJ, Warholic NM, Sneeringer CJ, Allain CJ, Klaus CR, Sacks JD, Raimondi A, Majer CR, Song J, Scott MP, Jin L, Smith JJ, Olhava EJ, Chesworth R, Moyer MP, Richon VM, Copeland RA, Keilhack H, Pollock RM, Kuntz KW. 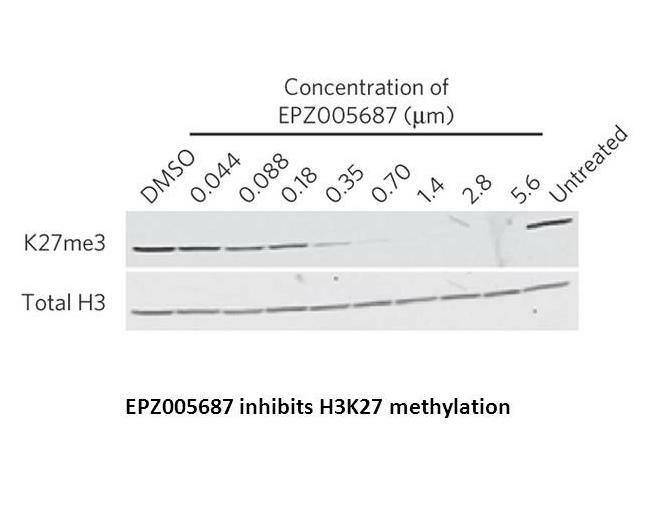 A selective inhibitor of EZH2 blocks H3K27 methylation and kills mutant lymphoma cells. Nat Chem Biol. 2012 Nov;8(11):890-6.
. Chen L, Wu Y, Wu Y, Wang Y, Sun L, Li F. The inhibition of EZH2 ameliorates osteoarthritis development through the Wnt/β-catenin pathway. Sci Rep. 2016 Aug 19;6:29176. 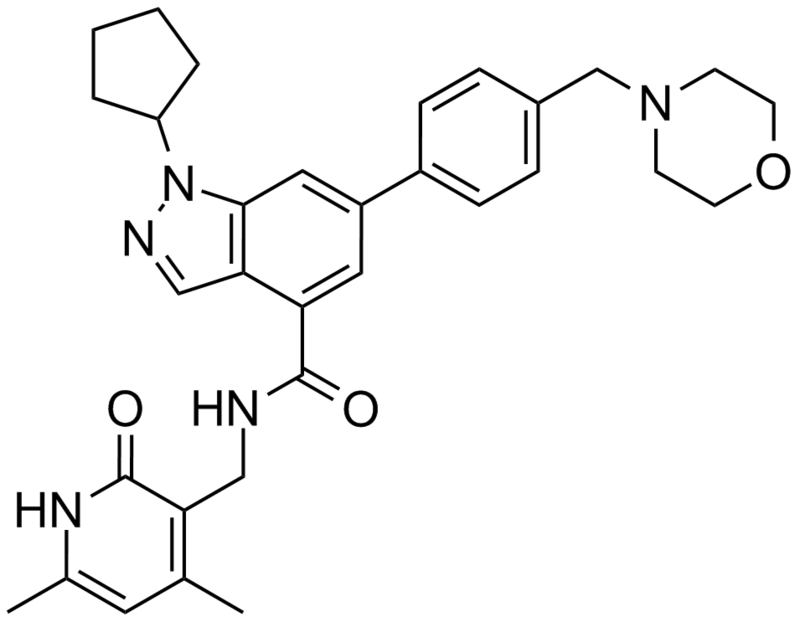 EPZ005687 is a potent inhibitor of EZH2, an enzymatic subunit of polycomb repressive complex 2 (PRC2) catalyzing the methylation of histone H3 lysine 27 (H3K27), that inhibits EZH2 with a value of inhibition constant Ki of 24 nM, which is 500-fold and 50-fold greater in selectivity than 15 other protein methyltransferases and closely related EZH1 respectively. EPZ005687 concentration-dependently inhibits the enzymatic activity of PRC2 with a value of 50% inhibition concentration IC50 of 54 nM through binding to the S-adenosylmethionine (SAM) pocket of the EZH2 SET domain. 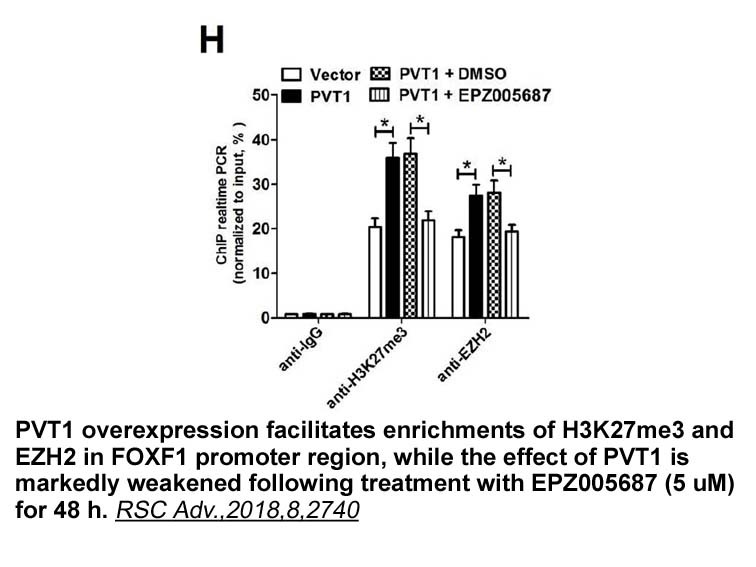 Study results have shown that EPZ005687 reduces H3K27 methylation in a variety of lymphoma cells and induces apoptotic cell killing in heterozygous Tyr641 or Ala677 mutant cells. Knutson SK, Wigle TJ, Warholic NM, Sneeringer CJ, Allain CJ, Klaus CR, Sacks JD, Raimondi A, Majer CR, Song J, Scott MP, Jin L, Smith JJ, Olhava EJ, Chesworth R, Moyer MP, Richon VM, Copeland RA, Keilhack H, Pollock RM, Kuntz KW. 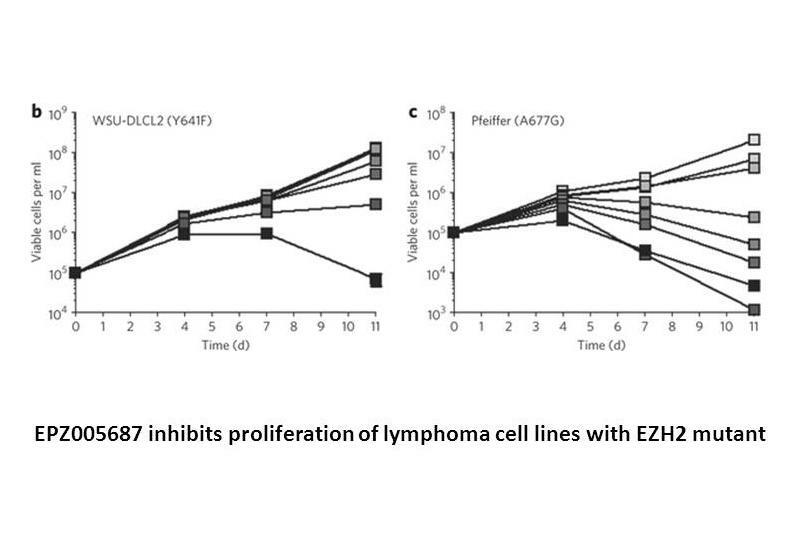 A selective inhibitor of EZH2 blocks H3K27 methylation and kills mutant lymphoma cells. Nat Chem Biol. 2012 Nov;8(11):890-6.